ABOVE: So near and yet so far. 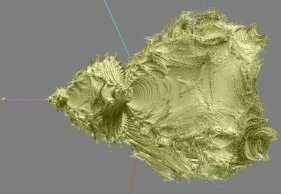 This cool 3D Mandelbrot-shaped picture (rendered by Thomas Ludwig) looks promising, but careful examination will reveal it not to be what we're looking for. Timestamp 21/03/2008: Probably no eye has ever seen the wonders of the 3D Mandelbrot set. 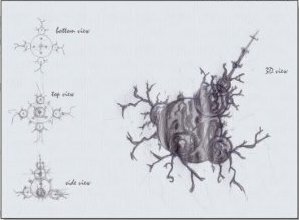 This page goes in search of the elusive beast - and what could be considered by some to be the Holy Grail of fractals. 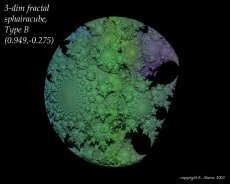 Existence of 3D Mandelbrot set? t's been around 30 years since we all first saw pictures of the famous Mandelbrot set; thirty years of exploring its unending beauty and variety. Only the advent of computers made this possible, since hundreds of thousands of (actually quite simple) calculations need to be made before we can begin to see what the thing even looks like. 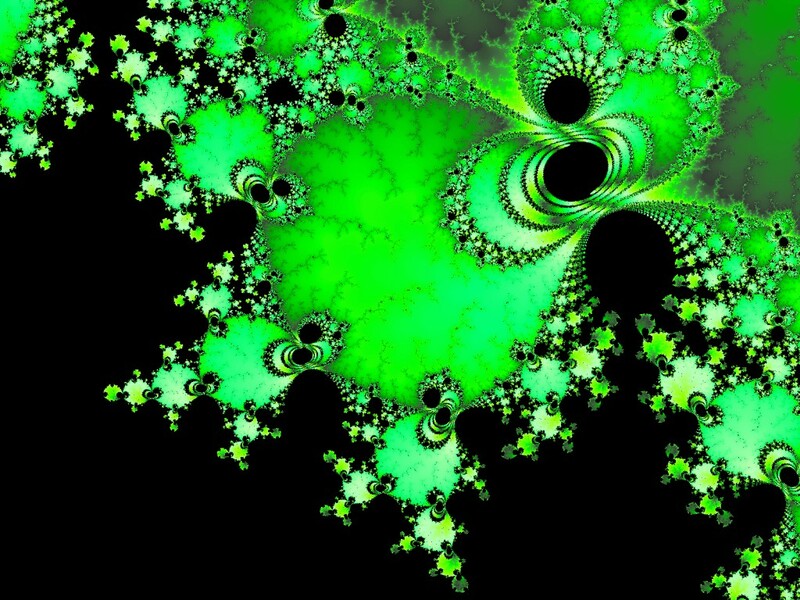 When Mandelbrot first saw the shape's outline - that was in itself a curiosity - but nothing could have prepared him for what he saw when he zoomed in. The edge of the basic Mandelbrot shape gave way to millions of intricate details, which after further zooming, unveiled elaborate shapes of every type and description. Before I continue, here's a small collection for your viewing pleasure (created with Chaos Pro). Click any picture to enlarge. "Quad-pod" - This is a zoom into the Peapod fractal from below. Mandelbrot Christmas tree - The only picture generated here that has been 'enhanced' with rain drops overlayed. "Mega-spiral" - You always get these type of images on the thin end of the branches. 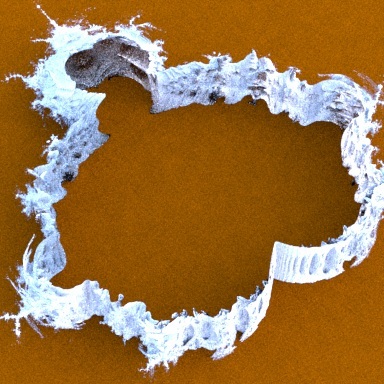 "Foam It Up" - Some parts of the Mandelbrot form an ultra light foam texture. Holds up to 80% more moisture than aerogel! It looks as if just the tip is colored white, but in fact, if you zoom in far enough, the rest is outlined white too. 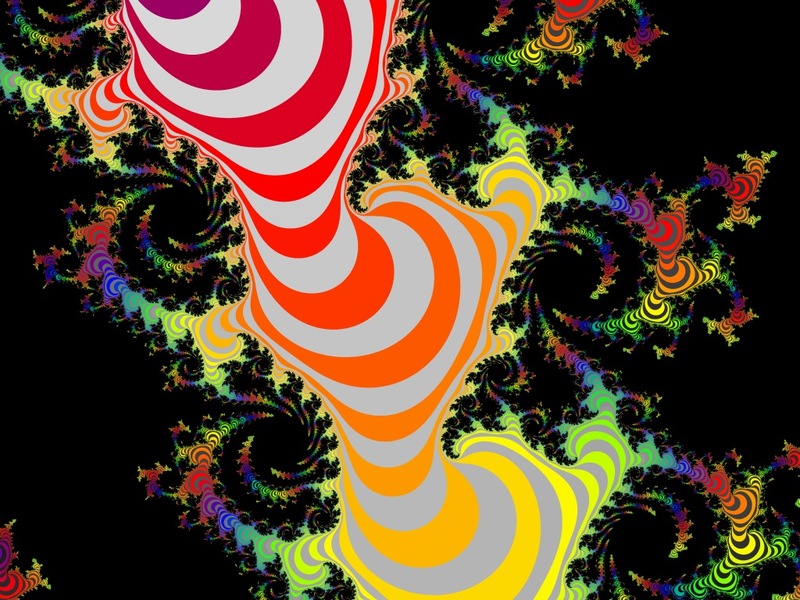 Roll up, candy spirals off the end of a Mandelbrot stalk - get yours half price today! 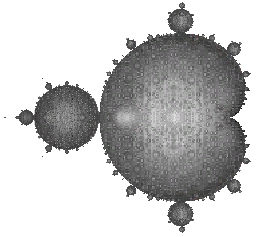 Mini versions of the Mandelbrot pervade the fractal - nicknamed the Mandelbug. Type 1: "Spin me right round baby"
Also known as the "vase lathe", this design looks neat, but is effectively a 2D Mandelbrot spun round its own axis. In fact, there are a few different ways of creating this shape (such as using Quaternion math). The object looks 3D, but the detail is still really 2D. 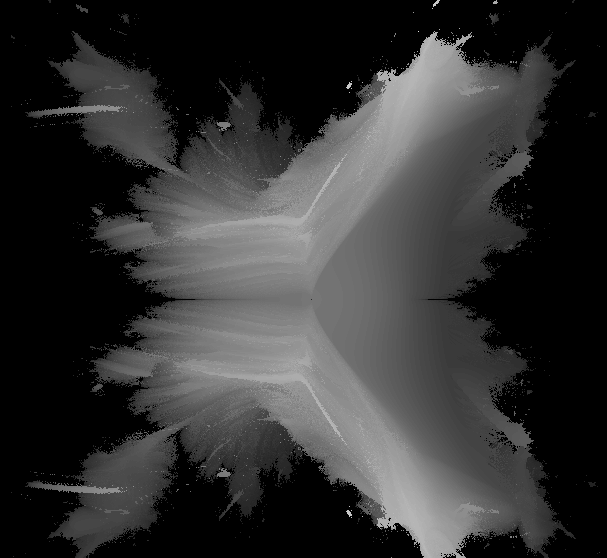 Type 2: "Mountain out of a 2 dimensional molehill"
Okay maybe that trivializes some of the possibilities from this fractal type, but hey, this one 'cheats' too. 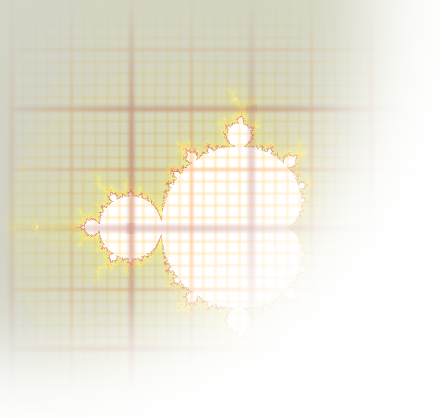 The idea is to take the iteration level, and raise or lower the shape instead of coloring it (as in traditional Mandelbrot pics). The results can be stunning, but it's still 2D at heart. See here for the full Youtube animation. Mountain mandelbrot by Anton Feenstra. 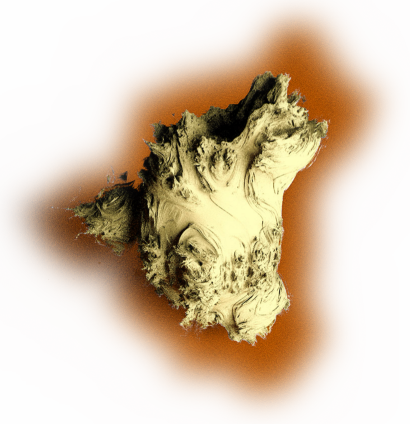 This beautiful image created by Aexion looks great, but it's not exhibiting fractal detail in all 3 dimensions. 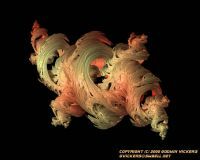 Type 3: "Bubblegum Flavored Whipped Cream"
This type is based on fractals in 4 dimensions using Quaternion math. Despite the complex sounding theory though, we can see that the detail is effectively one or two-dimensional with the 3rd dimension being turned into a whipped cream smoothie. I have my doubts that the 4th dimension fares any better. Looks tasty though. 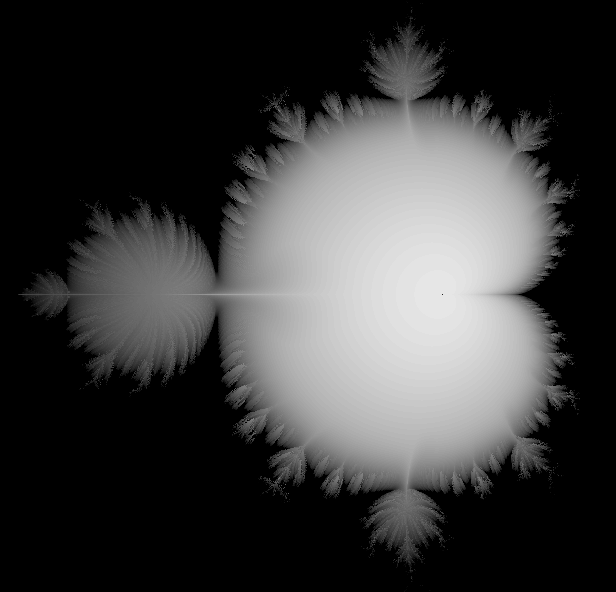 (Note that these images are in fact based on the Julia set, which is closely related to the Mandelbrot). 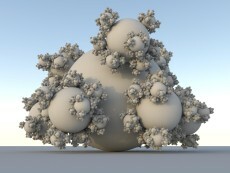 Quaternion julia fractal by Paul Bourke. Type 4: "Climbing Frame Madness"
This more recent "Tetrabot" type was discovered around 10 years ago by Prof. Dominic Rochon. 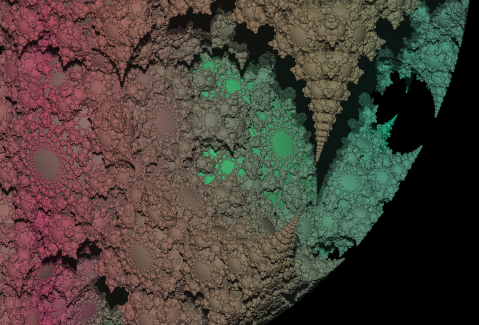 The variety of shapes are intriguing, approaching the Mandelbrot set in their subtlety. However, detail levels are somewhat poor (apart from at high iteration levels where unfortunately the 'frame-work' becomes so thin you can't see it). Still, this is a good attempt at creating something a little more 3 dimensional. part of a larger design. No, the thing I've been looking for has the essential characteristics of the traditional 2D Mandelbrot, but extended to 3 dimensions. 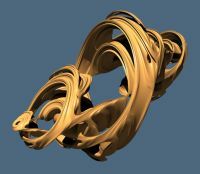 It's hard to imagine what such an object might look like (or even if it ultimately exists, although maths has a knack of doing pretty much anything), but we can be sure of one thing - it will have exquisite detail running through each dimension, far exceeding the versions shown above. We can try and guess the overall shape's outline too. Marco Vernaglione took a stab and came up with the artist's impression you see to the right (part of a larger quest to find it - see the full image). I myself sketched an overhead version which might come fairly close (see left). The lighter shades of grey represent nearness. 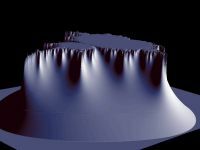 Below is a third visualization using a formula I created based on pseudo 3 dimensional complex numbers (and nicely rendered by Thomas Ludwig). Although it looks nice, we can expect the real deal to have lots of differently sized 'spheres' attached to a main apple shaped center (in contrast to circles attached to a cardioid center from the traditional 2D mandelbrot). Unfortunately, the version you can see below has much in common with the "Whipped Cream" fractals shown earlier, and if we zoomed in, we can probably expect smooth contoured surfaces with little in the way of fractal detail. Also see Thomas' amazing metallic render of the same design. 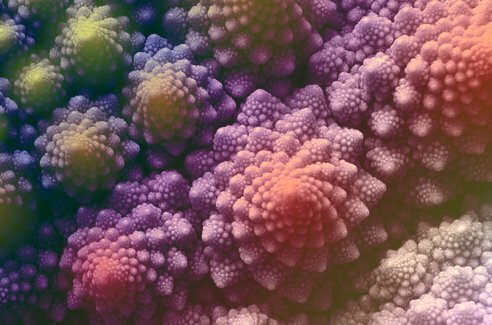 Okay if this looks familiar, that's because you'll probably recognize it as Romanesco Broccoli - the coolest looking vegetable in the world (and certainly the most fractal-like). I added some colour in a somewhat successful attempt to spruce it up, but the original photo by Alfredo Matacotta is featured here. If you want to see more Romanesco Broccoli, then I suggest you Google it. 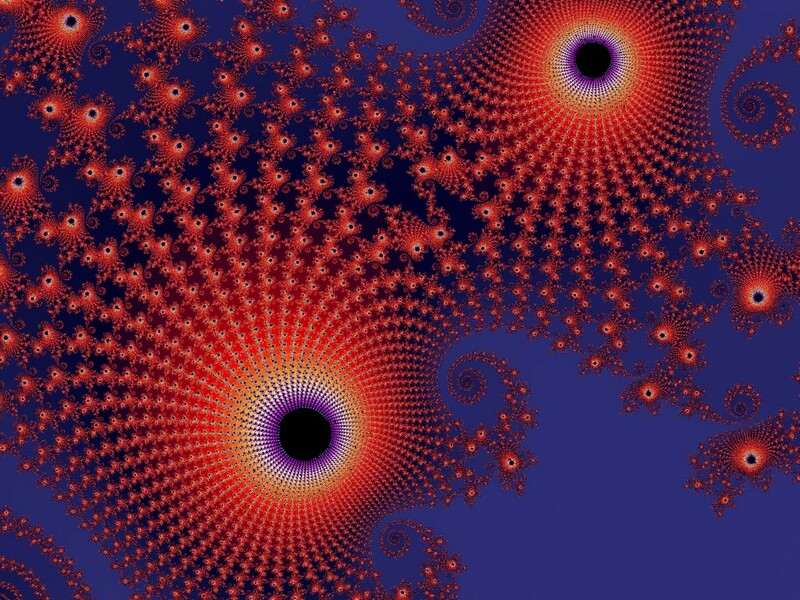 Dr. Kazushi Ahara and Dr. Yoshiaki Araki first discovered this amazing Quasi-fuchsian fractal. You can see a video on Youtube, their gallery (from which this picture is taken), or their website. 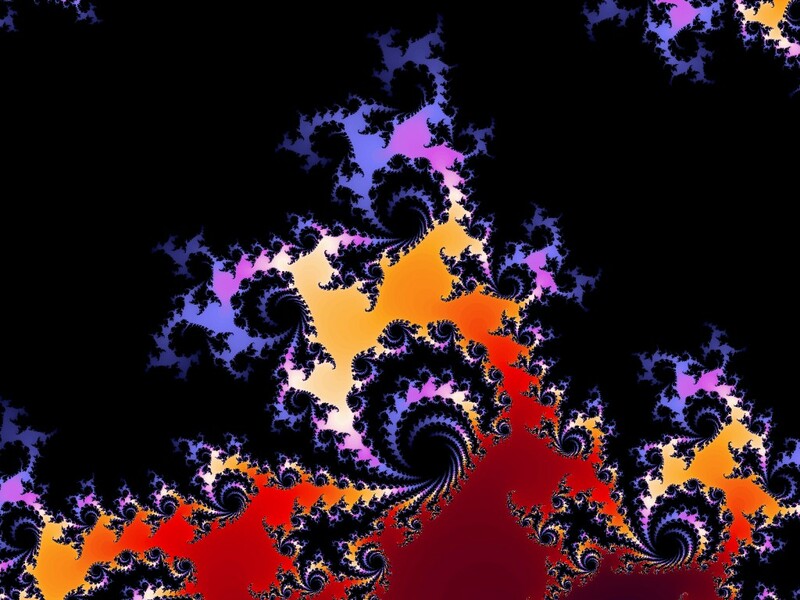 What's so amazing about this fractal is first how it contains detail in all 3 dimensions, but also how close it comes to the style and character of the 2D Mandelbrot set. 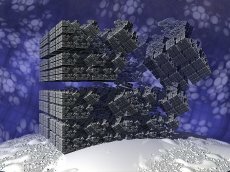 3D fractals are by and large very ordered, and more organic objects such as the Mandelbrot are incredibly rare in the 3D world. Unfortunately, as far as I know, the object will not have quite the variety of the Mandelbrot once you've zoomed into a section. Still the Quasi-fuchsian is definitely something I would like to explore further. 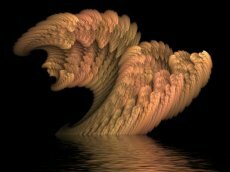 This cool 3D fractal created by Gilles Pouliquen, and rendered by Thomas Ludwig, is an interesting attempt at creating the 3D Mandelbrot, and a lovely shape in and of itself. (but still no cigar...). 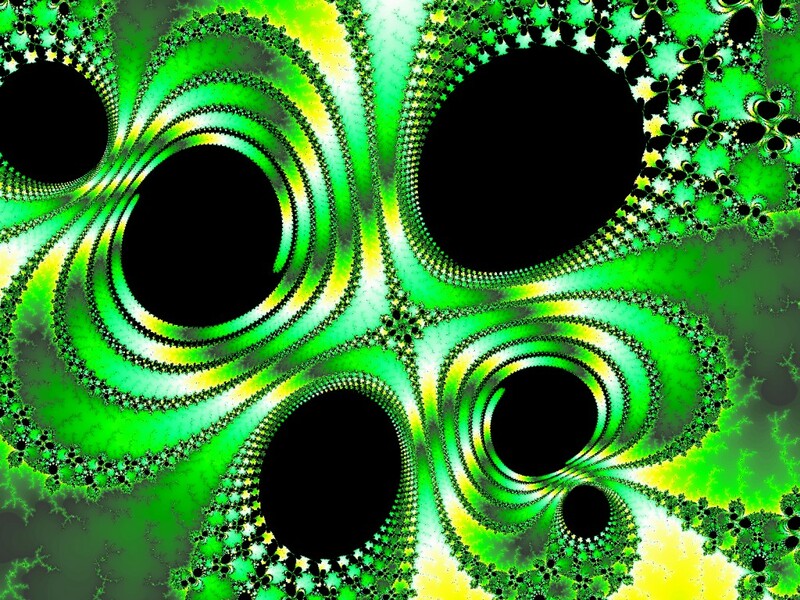 The Mandelbrot set merges with the "Tricorn" fractal (or "Mandelbar" set) to form this interesting 3D hybrid created by Eric Baird. Love to zoom into this also, but once again, we can most likely expect a 'whipped cream' surface once we do. Search as long as you like. I doubt you'll have any more luck. As for me, I've been hunting the net high and low, asked on forums, and even created my own algorithms in an attempt to find it, but my search has thus far eluded me. 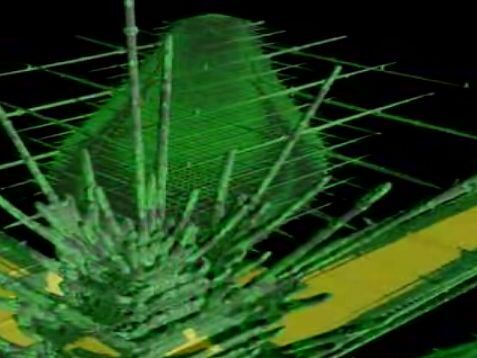 Is it really possible to compute a REAL 3D Mandelbrot? 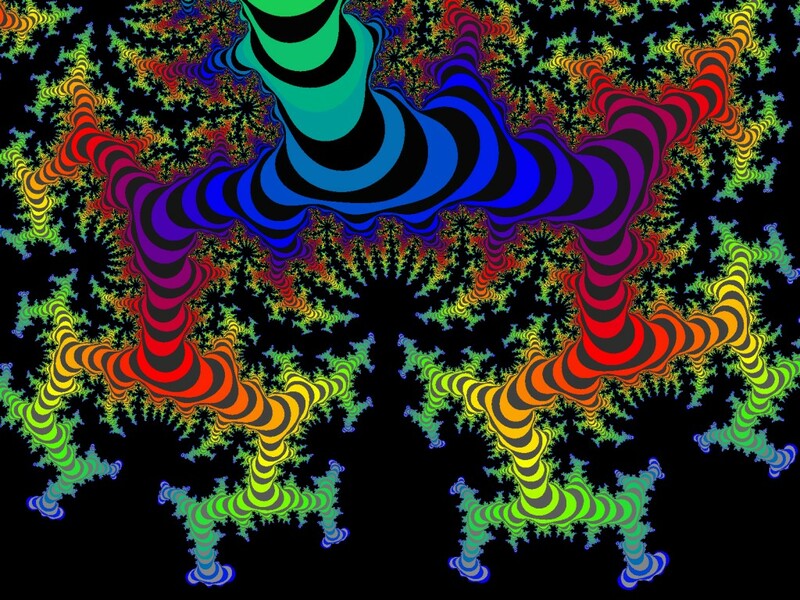 I've heard when rendered it's in the shape of an 'apple' with arms or tentacles growing off of it - I've been told this fractal was given it's own name, and that it's not called a "3D Mandelbrot". > Has anyone tried to generalize the Mandelbrot set to include a third dimension? 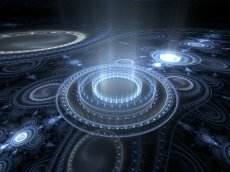 "Does anybody know of a 3d fractal set, e.g. 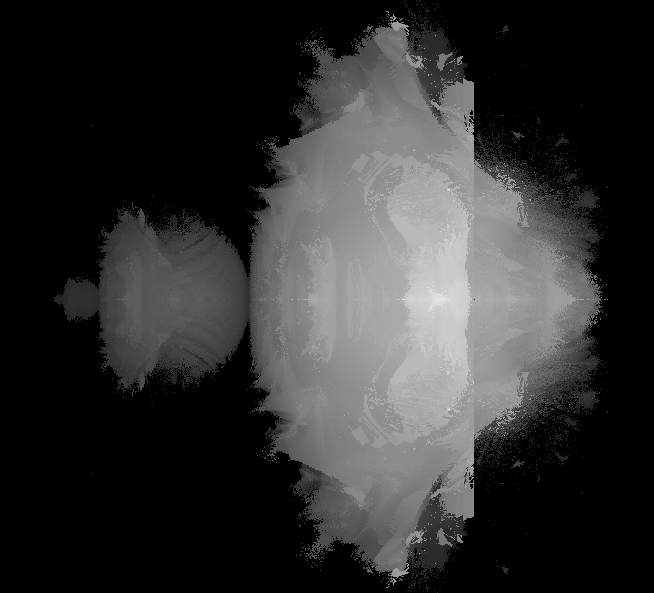 a 3d mandelbrot? (And I don't mean the graphic presentations using heights instead of colours - rather globes instead of circles, and an "apple" instead of the main cardioid.)" 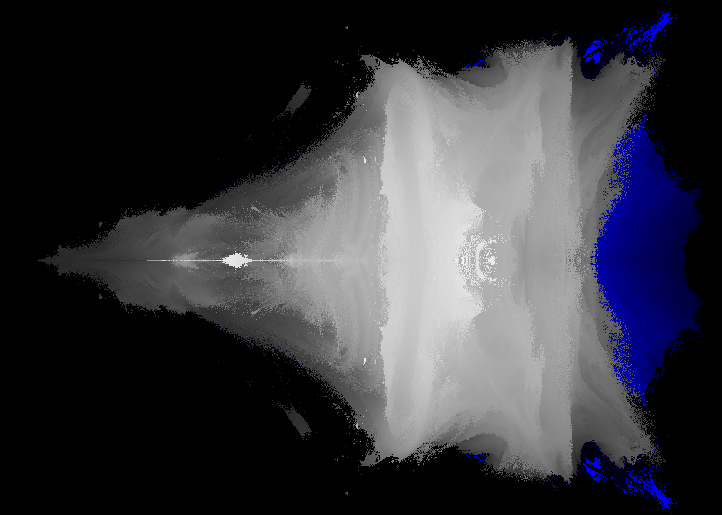 The middle picture is doing just that - varying the exponent (and representing the depth as different shades of grey), but we're just morphing between the 2D mandelbrot (left) and its relation - the 'Tri-Mandelbrot' (right). Not what I'd call spectacular. Morphs using other exponents produce similar results of course. Here's a YouTube animation of this technique going through all the various powers. In the end I remain skeptic until I actually see it. If it really was discovered by now, surely there would be at least one picture on the net somewhere? "Representation of 3-D General Mandelbrot Sets Based on Ternary Number and Its Rendering Algorithm" by Cheng Jin, and Tan Jianrong. (download paper). 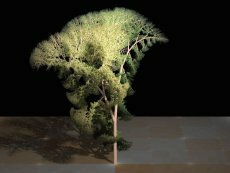 "Utilizing Barnsley Fern as Orbit Trap to Construct Virtual Three-Dimension Generalized Mandelbrot-Julia Sets of Newton Transform" by Wang Xing Yuan, and Wang Tingting. 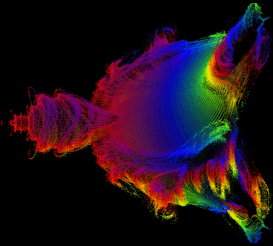 "Generalization of 3D Mandelbrot and Julia sets" by Jin Cheng and Jian-rong Tan. (download paper). 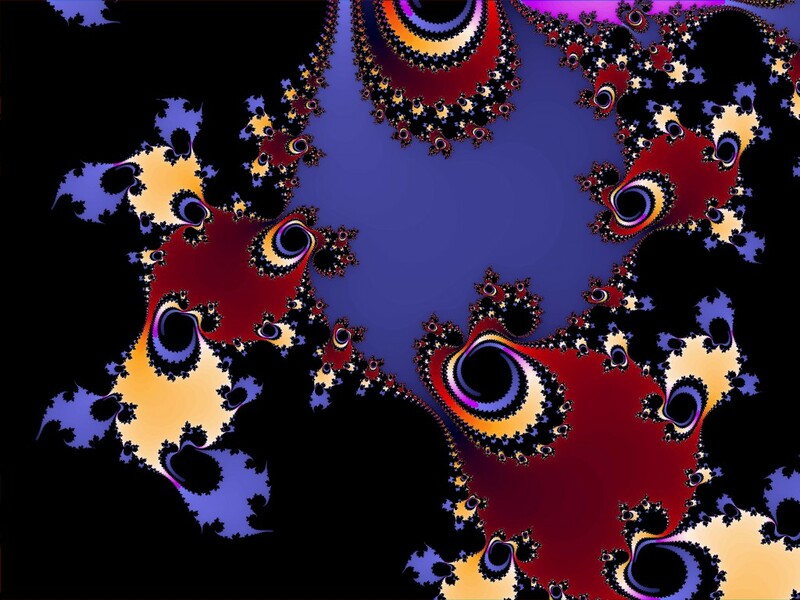 "On Constructing Julia Set and Mandelbrot Set in Four-dimensional Space" by Xiao-Fan Qian. 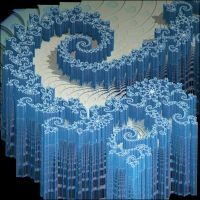 "A non-distributive quad algebra for 3D renderings of Mandelbrot and Julia sets" by Terry W. Gintz. "3D representation of the Mandelbrot set" by Kenji Nagashima, and Hiroyuki Morimatsu. ...two of which had a PDF download link. To cut a long story short, any images of the 3D Mandelbrot contained therein were of the four categories defined earlier (excluding whipped cream; I couldn't find any of those surprisingly ;). 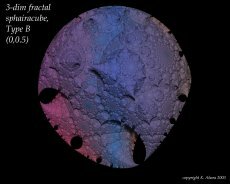 My main hope for discovering the 3D Mandelbrot set was based around the idea of spherical coordinates and my so-called "3-dimensional numbers". That may sound technical to many of you, but the following section in which I explain my method will have little or no maths at all. 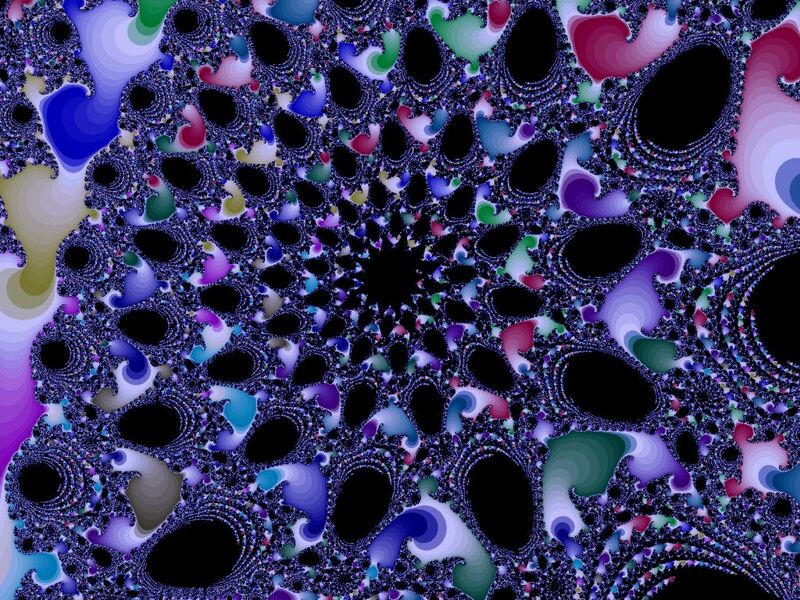 First off all, I will explain how the traditional 2D Mandelbrot fractal is created without saying a word about 'complex numbers' or 'quadratic polynomials'. 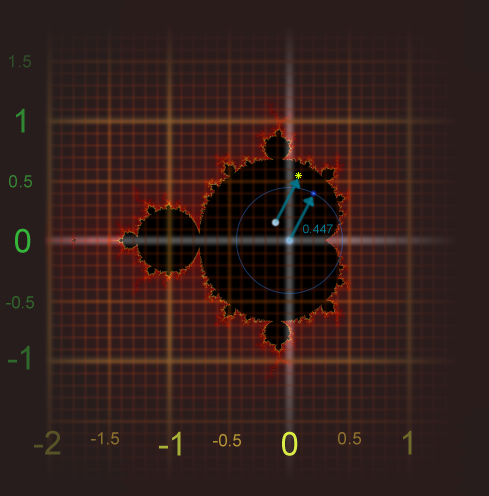 OVERVIEW: Basically, the Mandelbrot can be plotted on a graph as shown below. 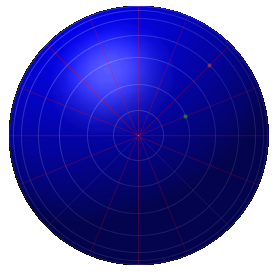 Let's test a point at x=0.2, y=0.4 (shown as blue dot below). 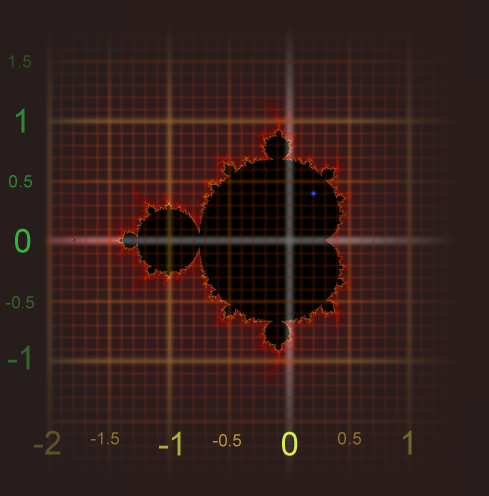 The computer has to decide whether the point at x=0.2, y=0.4 is part of the Mandelbrot set or not. We know it is, because the blue dot is inside the Mandelbrot shape, but the computer only has the numbers x=0.2 & y=0.4 to go by. How can it decide? STEP 3: Now, move the new point by as much as the initial vector was worth (the blue arrow or x=x+0.2, y=y+0.4). The yellow star represents the final position! STEP 4: Finally, perform the above 3 steps again, but this time with the yellow star point replacing the old blue point (however, make sure you always use the ORIGINAL blue arrow for the final movement in step 3 (i.e. always move it by x=x+0.2 y=y+0.4). Once you've gotten the new "yellow star" point, do the same again, and AGAIN. In fact, keep doing it, until the "yellow star" point either flys away to infinity, or closes in on the center at x=0,y=0. If it DOES close in to the center, then the original blue point (at x=0.2, y=0.4) is colored black (i.e. is in the Mandelbrot set). 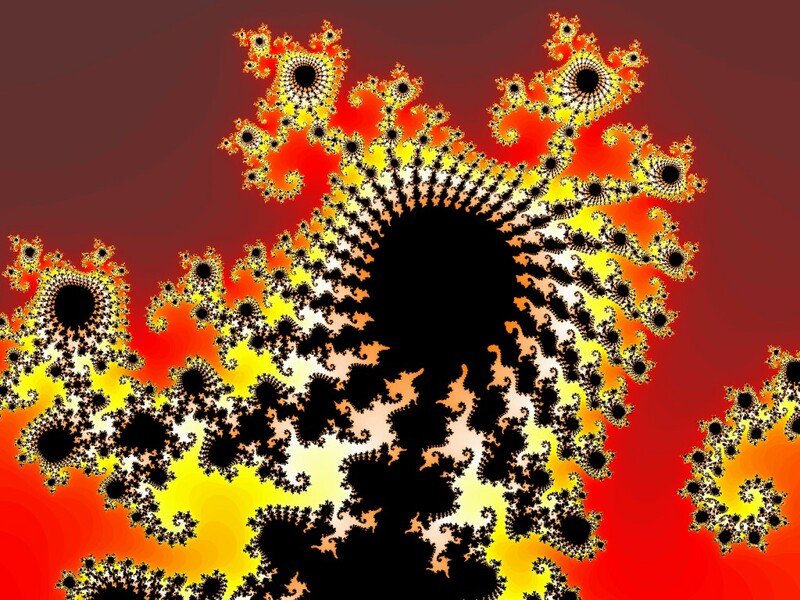 Otherwise, if it flies off to infinity, 0.2,0.4 is colored white (and is not part of the Mandelbrot set). STEP 5: Now do all of the above 4 steps, but not just for the point at x=0.2, y=0.4, but for every point inside the rectangle ranging from x=-2 to x=1 ...and... y=-1 to y=1. 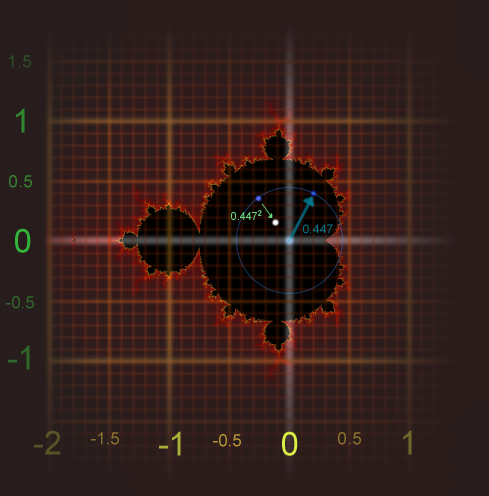 CONGRATS - You've just drawn a mandelbrot, and understood complex arithmetic without even knowing it! Steps 1 & 2 are actually complex multiplication, and step 3 is complex addition! Now extrapolate that to the third dimension. Instead of going round the circle, rotations take place round the sphere. This is the 'multiplication' equivalent of the complex number as shown earlier in step 1. Points on a sphere can be represented in a number of ways, but the one to the left is a standard way. Pick one of the white circles, and one of the red lines (which are circles too since they go round the back of the sphere). That way you can represent any point on the surface of the sphere. Now look at the green point on the sphere to the left. It's 2 white circle's worth going round the sphere (from front to back), and one red circle's worth going round clockwise (from 3-O'Clock). Doubling that rotation again (which is what we did in Step 1 with the 2D version), we end up with the red point at the top right of the sphere. We can use a similar distance function to the 2D version, and close in on the centre of the sphere (instead of the center of the circle). Finally, we can move the point again, very similar to way we moved the point in the 2D version. As usual, we repeat this process until the point flies off to infinity, or closes in on the centre of the sphere. Doing all this throughout all x, y and z points, we end up with something (bar a few minor details) approaching the shape to the above and right. 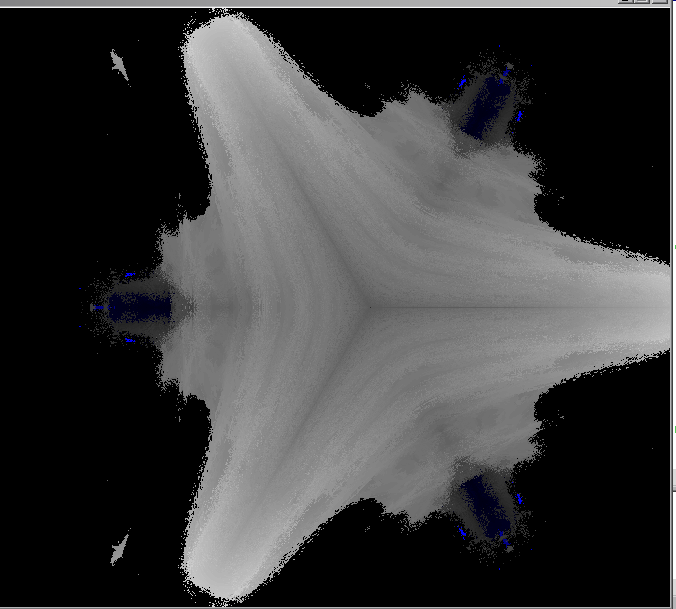 As said before, it looks interesting, but fails to show true Mandelbrot-style detail when you zoom in. Further experiments resulted in the orthographic images you see below (the first one is in fact an overhead view of the colourful image to the top right). Click each image to enlarge. For those that want to experiment along this route, the algorithm and explanation can be found here. I wish you the best of luck, and in any case, you'll surely have fun trying to search for it! 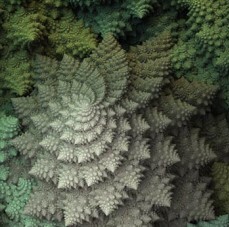 I'd like to conclude this article by showing the reader some of the most inspiring 3D fractals I've seen to date. They may not replace the hypothetical 3D Mandelbrot Set, but they each have their own incredible charm and beauty. 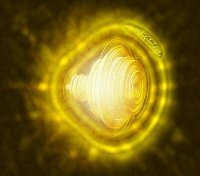 I have kept them as thumbnails, but have provided a link to each of their sites (click each picture) so you can see the full size and view more of their works. 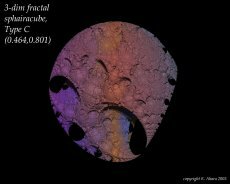 "(0,0.5)" Out of all the fractals on display here, these first three (created by Dr. Kazushi Ahara and Dr. Yoshiaki Araki), come closest to characterizing the original 2D Mandelbrot set, but in 3D! 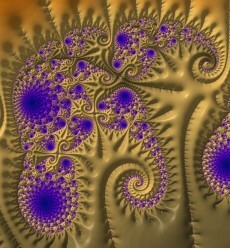 Click picture, or see their fractal gallery for high resolution versions. 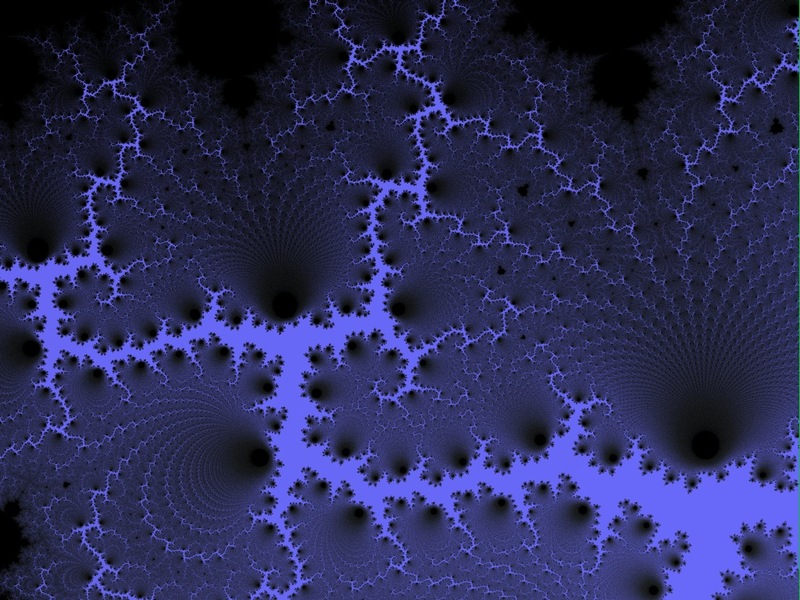 "(0.949,-0.275)" Another classic "Quasi-fuscian" fractal by Dr Ahara and Araki. The originals are all similarly coloured, so I changed them slightly for variety here. Gotta love the encrusted 'microbial' look in the many layers of detail. "(0.046,0.801)" The final pick of the gorgeous sponge-like spheres. If you want to see the animation, visit the YouTube site here. 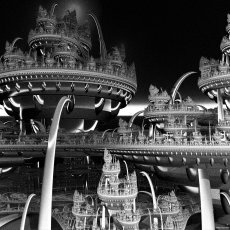 "Cipater" Created by Thomas Ludwig (aka Lycium), this unique fractal architecture combines order and chaos in its sweeping, fiery subsurface balconies. Also see his excellent frosty "Snow" picture, similar in style to this. 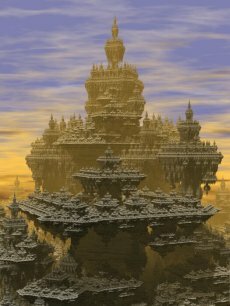 "The Return of the Sunset Castle" This jaw-dropping fractal created by Aexion looks like something straight out of science fiction. The subtlety of shade, the positioning of elements, the way each tier decorates the rim on the underside, all make this fractal a sight to behold. About the only thing I can fault is the lack of colour. 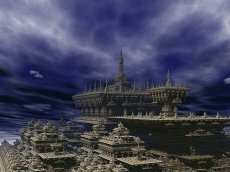 Also see inside the sunset castle or his earlier near-monochrome Sunset Castle fractal, both of which also look amazing. "Chaotic World" Also created by Aexion, this fractal uses some kind of circle packing technique around a sphere, but thanks to the slight randomization, crater textures, use of colour, it is so much more than that. Visit his site to see full size! "X01021" This inspiring design by Joseph Presley (aka fractart.net) comes under the class of the "iterated function system" fractal. 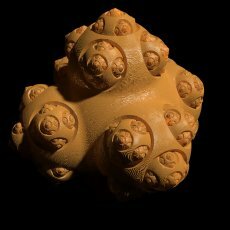 But what separates this from the rest is the judicious use of contrast between larger and smaller objects, along with the nicely shaped contours of the fractal 'shell'. Other pictures of note in his gallery include these ones. 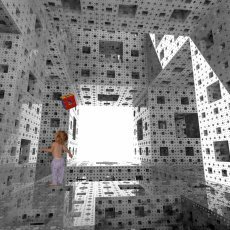 "Kid in Menger Sponge" The menger sponge is back, and it has some tricks up its sleeve, including full raytracing, reflection, and a snazzy perspective (other artists take note!). Created by Paul Bourke. 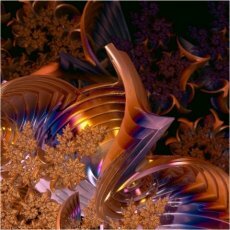 "Blobopolis Closeup" There are literally hundreds of these type of fractals on Deviantart.com, and it's no wonder why - it's fairly easy to create good looking results. However, this surpasses 99.9% of them through clever use of light, shade and pattern. We can thank piritipany for creating this fantastical paradise dome. 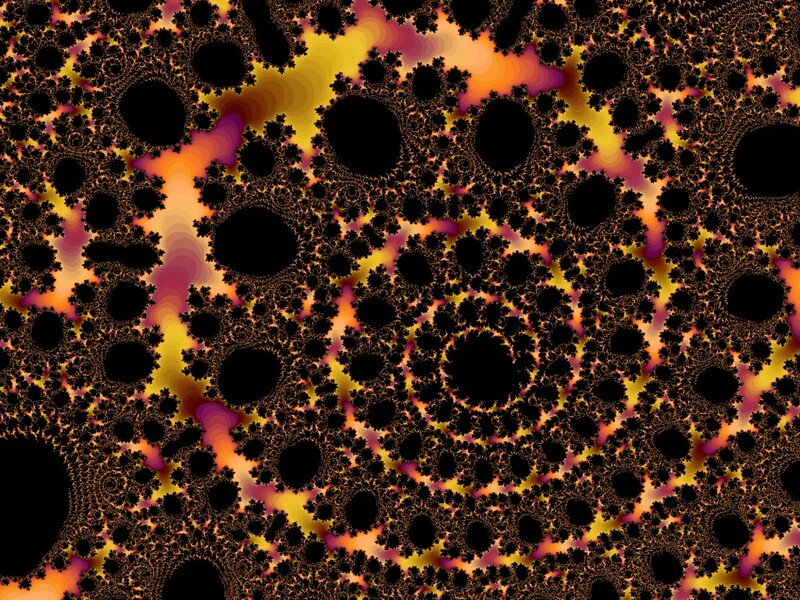 Here is a variation on the fractal. "Field of Depth" The creator of this masterpiece won a contest on deviantART.com and it's not hard to see why. The way the 'fabric of spacetime' is dented by the spheres looks good enough, but Zueuk creates fantastic drama in this molecular apocalypse through the use of clever lighting and motion effects. See his gallery for full size and more cool pics like this. 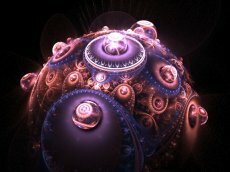 "Dreams Of Loneliness" One of the best Apophysis renders ever, this gem created by Xavier Hemon is quite simple, but effective due to the mesmorizing patterns of neon light and design of lower levels. 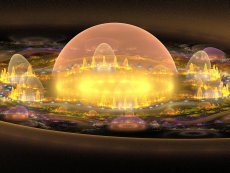 "jOrb" Worlds within worlds of exquisite detail, Christopher Payne (aka Khan71) did a sterling job in using Apophysis' powers creatively. "Rise" What happens when you join numerous Sierpinski tetrahedrons to form an icosahedron? Something similar to the above, as is demonstrated by Thomas Ludwig (aka lyc). Beautifully ray-traced, this object looks like some kind of foam I want to squish. As well as the Quasi-fuscian objects, I want real life versions of these. "Cubism" And here we witness the Cantor Dust Fleet joining the borg collective to unite as one. 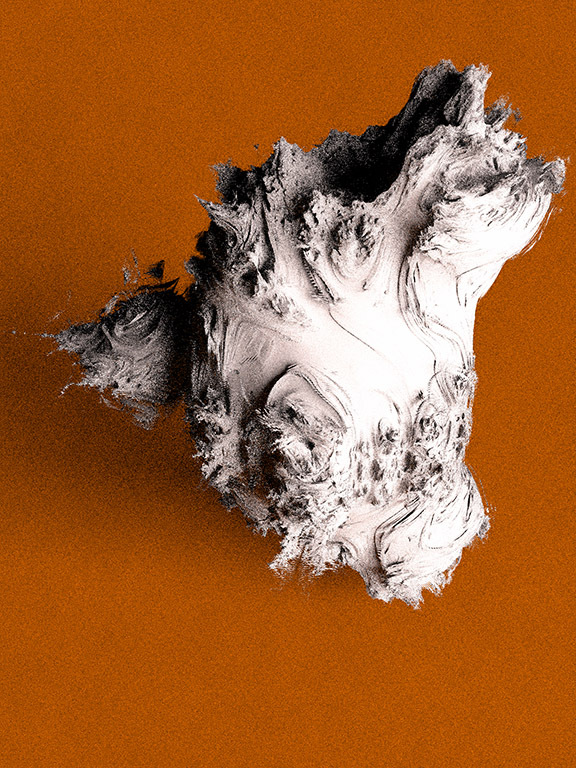 This curious fractal by Stefan Vitanov is a neat twist on an old trick. 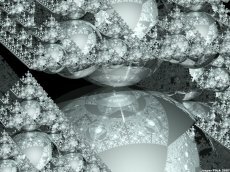 "Fractal Reflections" Okay, this one's a bit simplistic, but the polished material, spherical building material and general camera position helps make the otherwise ordinary Sierpinski pyramid a little more special. Created by JRJay. Also see his excellent flash animation. Fractal Structure And Some Red (Feb 03 2007) If any of you have ever played the brilliant game - Marble Madness, you'll feel right at home with this fractal by Rune Skovbo Johansen. Nice concept, and execution. A little more variety of shape would be nice though. As usual, click picture to see full size. 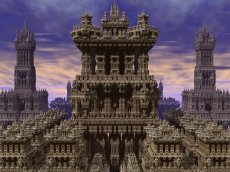 "Ivory Tower" Stefan Vitanov (aka Fractalexperience.com) has created many variations on the fractal tower (see his gallery for more), but the three presented here are arguably his best. Despite the lack of colour, the fogging, 'rotational' shape recursion, and atmosphere make this one not to miss. One day, all buildings will look something like this. "Temple of Shadow" Great shot again by Stefan Vitanov. I want more colours and higher resolution though please! "City (2)" Our last pick from Stefan Vitanov's fractal temple series. "Inside the Sierpinski Temple" David Makin (aka MakinMagic) has also created variations of the fractal temple - this one's on the inside. Here's another view. Also see his brilliant animation inside the temple. 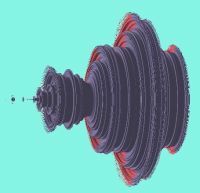 "Spherism" This just made the list thanks to the cool texture, and somewhat unusual fractal extrusion style. Taken from Yanekthedarkangel's gallery. 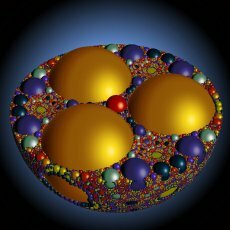 "Sphere packings in 3D - Tetra 1" A treasure of tasty spheres packed into one. Good for a snack or if you want to fill in between meals. There's plenty more where this came from. Also see his excellent sculpture gallery. "Rising Apophysis III" Combining sculpture with fractal goodness, this image created by Michael (aka Gibson125) uses vast plumes of smoke to carve the shape you see in the horizon. Also see the Twisted Cube created by greenhybrid which has a similar atmosphere to this. 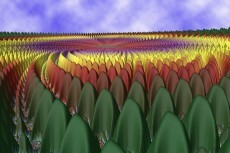 "Fractal tree Plate b 3" The best fractal tree I could find during my search. Let us know if you find a better one! Created by A.Kitaoka (?). 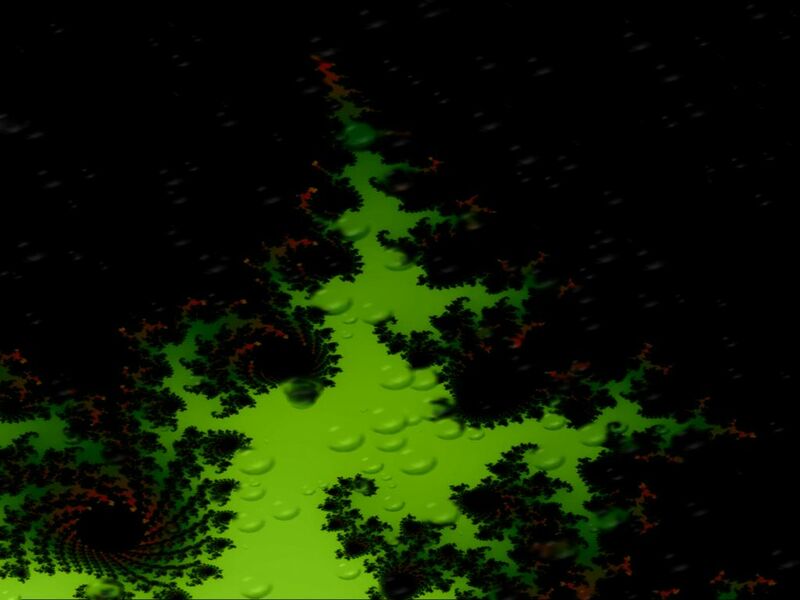 "Faire" This iterated function fractal by Bob Q (aka gateman45) just gets better the more I look at it. Very elaborate detail, but see full size to fully appreciate it. This expertly crafted abstract structure by Francesco Mai is barely a fractal, but had to be included, if only for the delicious translucent and golden material. 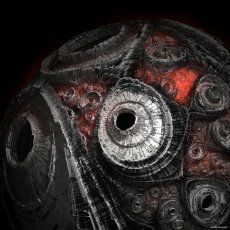 "Furnace" Another winner by Aexion (aka rfractals.net), and looking as though it came straight from the Matrix. Spectacular lighting and camera ensure this image gets its place in our top collection. "Opengl15" For this collection, we generally frown upon mountain-type fractals. But this image created by Jason Rampe (aka Softology) has enough going for it for inclusion - from the whirpool like imagery, to the vivid coloring. 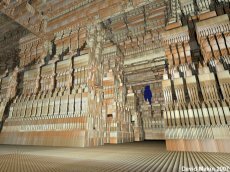 Also see Gibson125's amazing mountain fractal - "3D Fractal Landscape VI", and Duncan Champney's "Douaday's Easter Rabbit". 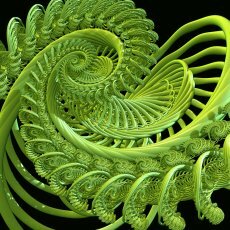 "Orbital Fern" Similar in style to Gateman's "Faire" work, this organic IFS fractal created by Phidelity begins to rival the Romanesco brocoli in its awesome detail and style. Food would taste much better if it looked like this :) See his other IFS fractals like this one, and if nothing else, see his AMAZING animation. "Sensible Extensibilities" This excellent image was also created by Phidelity. Also see his variation on the Xenodream shell. "Xeno_Dream_Test_Run" This image is actually based on one of the example routines in the XenoDream fractal program, but f__l__A__r__k_s has done a good job in bringing the most out of it with his use of colour. 3D Fractal Elephant Wow, this is gorgeous - the Aztecs would have been proud I'm sure. The combination of curves and corners along with the colour scheme gives a real sense of style and mystery to this piece. 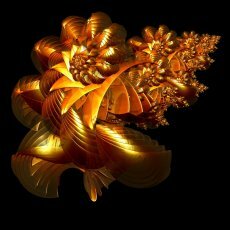 Created by Duncan Champney, see his 3D fractal gallery for more. Fractal Monoliths Our second pick from Duncan's gallery. Looking like a giant set of strange dominos, I love the perspective view in this one - the sharp angle gives a real sense of depth. 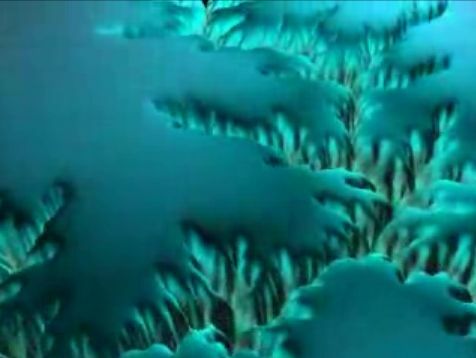 See his excellent Fire and Ice themed 3D fractals, also created by Duncan's "FractalWorks" software. Sphereflake level 9 Created by the user 'fpsunflower' down at ompf.org, this object has the characteristic Mandelbrot-style sphere on sphere idea. See the forum for a larger version, and an excellent 'night' version as well. 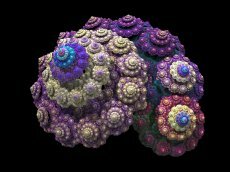 3D Fractal Broccoli Created by Aleksandar Rodic, this stunning visual is not real Romanesco broccoli, but rather a 3D adapatation. I prefer it to the original vegetable in many ways, not least because of the variety in colour that's possible. See his website for a great video and 3D anaglyph version. 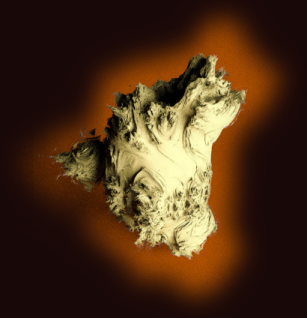 UPDATE 20/11/2009: See the Mandelbulb article for the latest news regarding the 3D Mandelbrot! 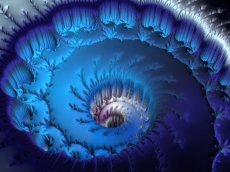 Rena Jones - Open Me Slowly Video - Probably the best 3D fractal animation I have seen. What are you waiting for, see it now! 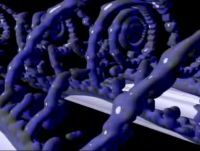 Evolving Fractal Animations - Also amazing. 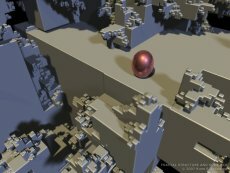 Very high details animations which warp and evolve fractals. 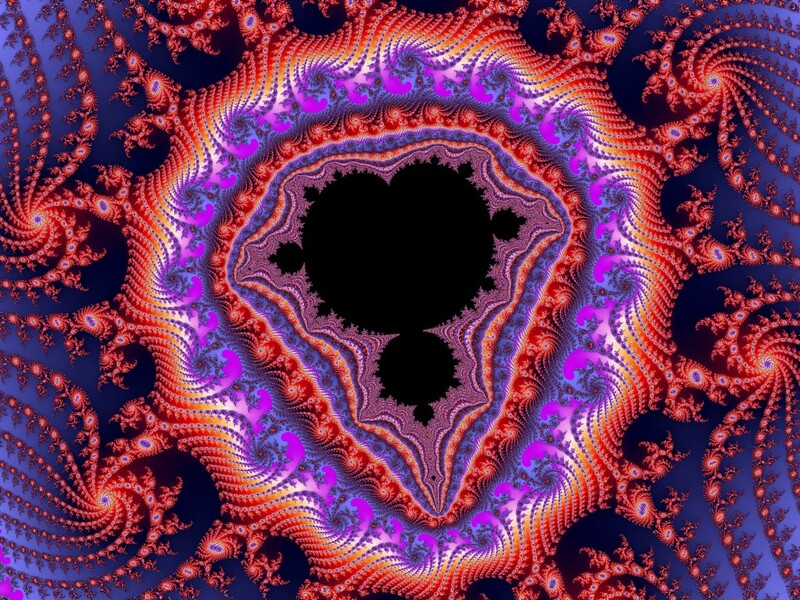 The Buddhabrot Technique - Interesting variation of the Mandelbrot. It's basically 2D, but looks slightly 3D-like, and also I think there's a 3D-esque version on Youtube. 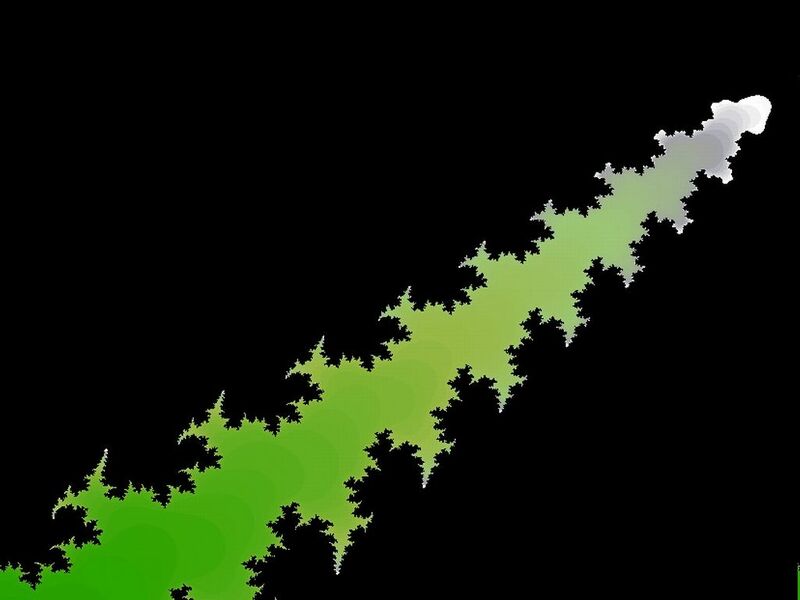 Growing Mandelbrot Zoom - This is the only video I've seen which grows the Mandelbrot as it zooms in. Very nice to see. 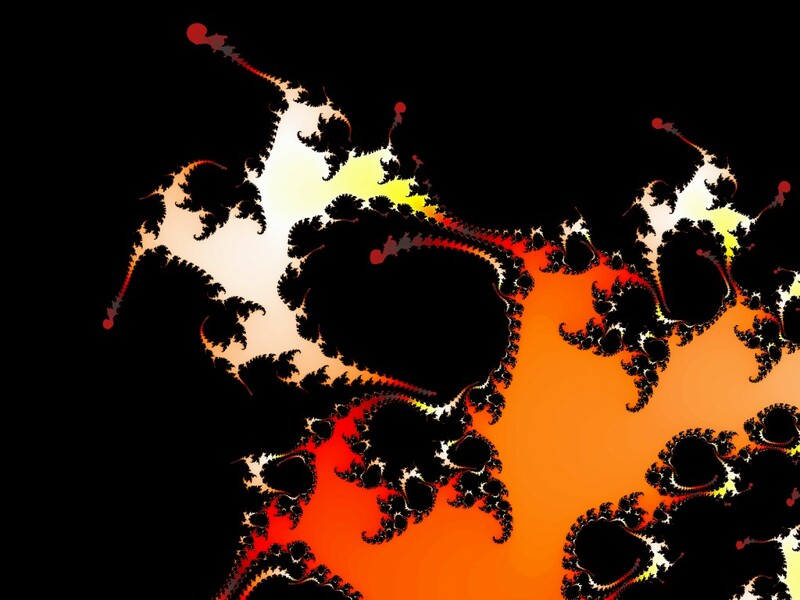 Fun with Fractals - Take a look at the 'MandelDrop' on this page. 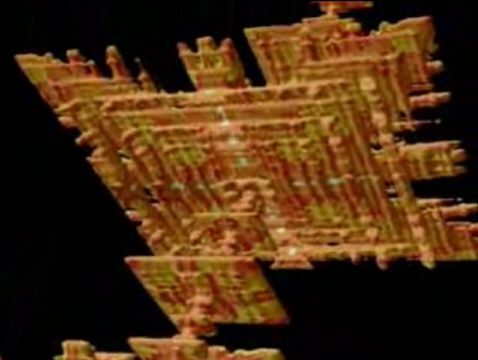 As well as the 3D Mandelbrot, it's something that would be amazing to explore inside if it was in 3D.